It’s spring time and everything here in our neck of the woods has turned green and lush overnight. The grass suddenly needs mowing, the flowers are starting to bloom and in Minnesota it’s still early for such things. So we are feeling quite an abundance of sensory delight at the exhilarating kick-off of this season of growth and re-birth. But, what’s up with the abstinence? Well, it’s now the second full week of Kip’s spring ritual of cleansing his system by forgoing wine for a month. Interestingly, his wine abstinence in the midst of this spring abundance has heightened our awareness of the beautiful interplay of opposites in life and nature. One delightful illustration (at least in my opinion) is that his abstinence from wine leads to a greater abundance of it for me. (fancy that!) The divine Rafanelli Zin from our previous post lasted all the way into the following week, allowing me to enjoy it on several subsequent evenings. A rare treat! In another example, Kip has noted that since he has been Not-Sipping wine, his already keen sense of smell seems to have intensified. While he is forgoing the use of one sensory tool, he has been tapping into another in greater depth. He spends more time pondering the aromas in the glass. Each time I sip, he sniffs. He tells me not only what he smells, but also what the wine will taste like based on the aromas he’s smelling. And his predictions have been startlingly correct! This week, in honor of the newness of spring, we decided to try a wine we’ve never had before. In anticipation of the coming warm days, we decided white wine was in order. And, in the spirit of exploration and adventure, we decided to branch out from our usual California territory. So I headed to one of our favorite local wine shops, appropriately named The Wine Shop, and sought the expert guidance of the staff. I asked for a non-California Chardonnay made by a small, family-owned winery with a cool story. Yes, that’s exactly what I said. 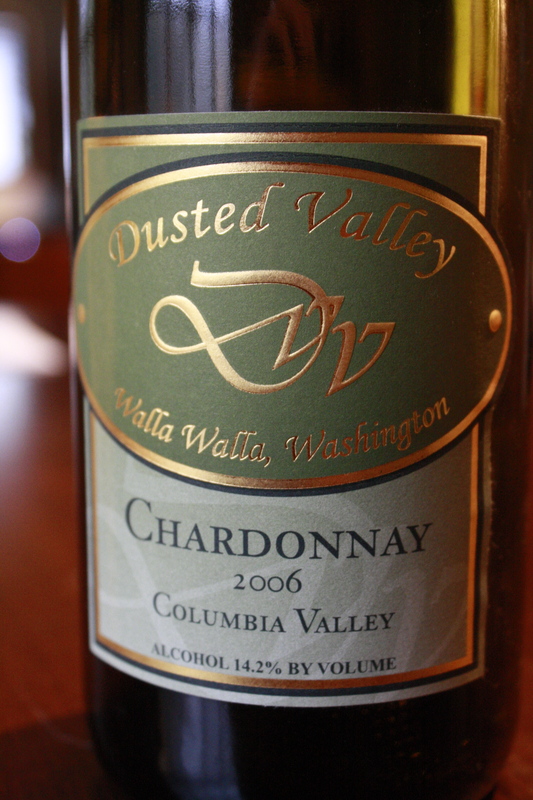 The staffer at the shop didn’t bat an eye as he confidently took me to the Dusted Valley Chardonnay from Washington. Sold! Sensing right away that they are a fun bunch, I liked them immediately. Brothers-in-law Corey Braunel and Chad Johnson and their spouses, Cindy and Janet, co-own the winery. The Bro’s-In-Law co-grow the grapes and co-make the wine, while the women run the business side of things. Yes, I thought to myself, these are our kind of people. The icing on the cake was that they call their wine club “The Stained Tooth Society.” Smiling at the humor of it, I liked the implication that Dusted Valley must have a passion for deep, dark reds. This could be the beginning of a beautiful friendship! When we checked the vintage of our bottle, the 2006 Chardonnay, we realized we’d be sampling one of the winery’s early efforts, as Dusted Valley was founded in 2003. We wondered how our wine shop happened to have an older Chard like this, since the majority of Chardonnay is meant for drinking young. We don’t claim to understand what transpires in the mysterious world of wine distributors, but we do know that an older lot of wine can mysteriously pop up sometimes and this can lead to a good deal for the consumer and a delicious surprise. The tasting results? Wonderful! To my palate and to Kip’s olfactory senses, this wine was not past its prime. Medium yellow color– a mix of sunshine and straw. Aroma of crisp, Granny Smith apples. Flavors of honey, pear and apple with beautiful acidity and a hint of creaminess as the wine opened up. Delightful balance. We were especially impressed knowing that this was such an early effort from Dusted Valley. We can’t wait to try some of their newer vintages, which, by the way, sport a completely redesigned label. Though the headline of this week’s post is about abstinence and abundance, the real story is about balance. It’s a lesson that wine teaches us over and over again. Too much or too little of anything can spoil the mix. And it’s just as true in life as in wine. So we raise our glasses in a toast to the art of balance and the on-going quest to find it wherever possible. Wine for One ~ Rafanelli Zin, please! I love being introduced to new labels with great stories as well. I will search out a bottle or two. Thanks for the insight once again! Love WA wines. Your comments tend to be spot on. Thanks so much, Lynne! We appreciate the compliment. Coming from you, with your understanding of wineries from the inside out, it especially means a lot. We are constantly delighted to find smaller producers, like you guys at iOTA, who manage to combine passion, fun and hard work to deliver such great flavors to our wine glasses. We haven’t sampled many WA wines but intend to do more. Cheers! love the stained tooth society – totally made me smile too. their story made me think of you and K and your dream that you are manifesting in nocal! luv u! Yes, we loved the “dream come true” aspect of this story, as well. And the thought of stained teeth. LOL. Thanks for being such a loyal reader of The Kitten, Sue Lynn. Love right back to ya! Having never met Kip, I can’t speak to his likely countless qualities, but I can say that I admire his will power! Holding the glass, sniffing the wine, predicting the flavors and nary a sip? I have no idea how he does it! TDC, I have to say I am equally amazed and impressed with his willpower! I don’t know how he does it, either. He said it has gotten easier the longer he’s into it, but he is most definitely looking forward to May 1st! I agree with your notion of having a balance with wine and with life. Look forward to reading more of the thirsty kitten, two things I also agree with. Cheers! Thanks so much, Chris, for stopping by the Thirsty Kitten! Please come again and chime in often. Cheers!